Black Capped Conures are small conures, reaching a length of approximately 10 inches from the beak to the tips of the tailfeathers. The Black-capped Conure, Pyrrhura rupicola - also known as the Black-capped Parakeet, the Rock Conure or the Sandia Conure - is native to the western Amazon basin from Peru to Bolivia and possibly the western edge of Brazil. Black-capped conures are generally sweet, playful pet birds. They are quieter than many other types of conures and they can learn some phrases and tricks. Well-socialized black-capped conures make delightful pets and thoroughly enjoy being part of the family. Some owners have noted that this conure very cutely sings in its sleep. They are very active, intelligent parrots that need a lot of pet bird toys and social interaction with its owner. This bird enjoys a busy house where a lot is going on; this tends to keep them content and entertained. Black Capped Conures make beautiful, intelligent, and fun-loving pets for the right people. While they do require a great deal of attention from their owners, they always seem to reward human efforts with their hilarious antics. Known to be little clowns, Black Capped Conures can be mischievous and curious, and have a tendency to get into things that they shouldn't when not properly supervised. For this reason, it is important for those who are interested in owning a Black Capped Conure to be sure that they have plenty of free time to spend with their new pet. Even hand-raised parrots can reject human interaction if neglected, and the same holds true for Black Capped Conures. Handling these birds every day is an important part of building a bond with them and having them accept you as a flock-mate. While they are not known to be especially good talkers, Black Capped Conures can learn a few words from time to time, and delight their owners with their chatter when they do. They can be very loud, noisy birds, and because of this, they are not recommended as good birds for apartments. In a nutshell, Black Capped Conures make the best pets for those who are true bird lovers -- those who don't mind cleaning up a mess from time to time or waking up to screeches and screams every morning at sunrise. Black Capped Conures pack all of the personality of a larger parrot into a small package, and for this reason, they are best for experienced bird owners. For the right person, however, they make extraordinarily loving, affectionate pets, and will surely enjoy their place among the most popular pet bird species for years to come. Known as friendly, easy-going birds, Black Capped Conures are highly social and highly trainable pets. They enjoy interacting with their owners, and they crave daily playtime and attention. Those who would like to own a Black Capped Conure should make sure that they have plenty of time to socialize and interact with their new pet. 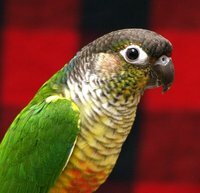 A lonely Black Capped Conure can become depressed and develop both medical and behavioral problems as a result. Black Capped Conures have a smattering of black feathers on their heads, faces, and chests. They also display various shades of green on their backs and tails, and a crimson blaze on their bellies. All Conures are active birds, and especially the Black Capped Conures. Those who own a Black Capped Conure need to make sure that the bird has a minimum of 2 hours out-of-cage playtime per day in a safe, supervised area. These birds need plenty of room to exercise their strong muscles, and plenty of toys for chewing and mental stimulation. Fruit such as: apples, pears, bananas, oranges, cactus fruits, forming about 30 percent of diet; vegetables such as: carrot, celery, green peas in the pod and beans; fresh corn; green leaves such as: Swiss chard, lettuce, kale, dandelion, chickweed; small seed mix such as: canary, millet, safflower, millet; limited soaked and sprouted sunflower; cooked beans and pulses; boiled maize; limited cubed hard cheese; complete kibble. Black-capped Conures are rare in aviculture and special care should be taken in ensuring that the breeding efforts are successful. Black-capped Conures generally lay four to seven eggs, which they incubate for 23 to 24 days. Properly cared for, Black Capped Conures can live for up to 30 years in captivity. Below are the dimensions of nesting boxes usually used for conures. However, the dimensions can vary widely, as they are influenced by the owner's and the birds' preferences. The preferences of the breeding birds can be influenced by the size and type of nest-box / log in which the bird was hatched and reared. Experienced breeding pairs may seek out nest boxes of the type and size they successfully bred in in the past. Inspection hole:Can be square or round, approx. 4 inches (100 mm) in diameter. Location and heightof log / nest-box: Install in a sheltered part of the aviary at about 5 feet (~1.5 - 1.8 meters) height, but not too close to the roof to cause heat problems in the hotter months. Angleof log or nest box: 45 degrees through to vertical. Most boxes are vertical. Nesting log / nest-box material: Add about 2 inches of decomposed suitable nest box litter to the bottom of the box to help stabilize the eggs and absorb the droppings from the chicks. Options for suitable nesting material are decomposed non-toxic saw dust, corn cob, shredded newspaper, clean straw / dried grass or wood shavings (i.e., Aspen shavings or wood chips). The larger wood chips the better, so the parents don't feed it to the babies or the chicks accidentally ingest it. Black Capped Conures are a lot more quiet and laid-back than most conures. Volume is not nearly as loud as the larger conures. Frequency of noise is moderate. Expect some squawking at dawn, when entering or leaving the house, and if disturbed while trying to take a nap or while sleeping. The volume level is very well suited for apartment living. Frequency tends to increase if they don't get enough attention or toys. These birds don't seem to mind a noisier household, making them more suitable for families with children. Although, expect them to join in as your household noise level increases.